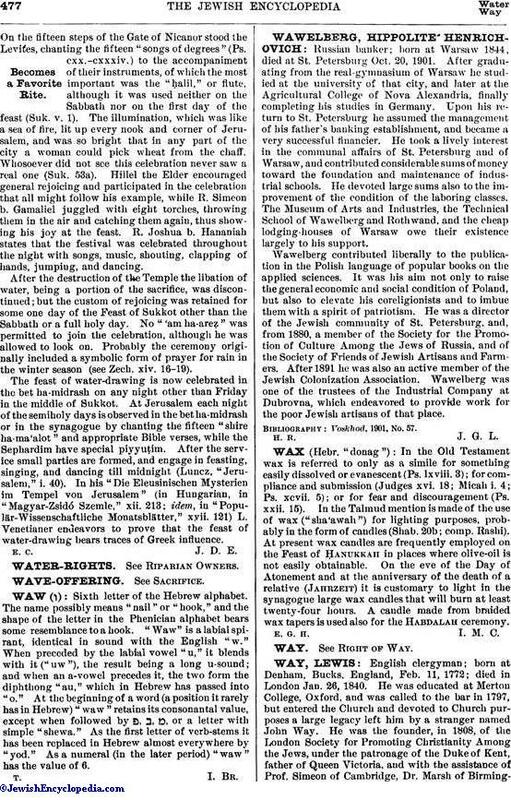 In the Old Testament wax is referred to only as a simile for something easily dissolved or evanescent (Ps. lxviii. 3); for compliance and submission (Judges xvi. 18; Micah i. 4; Ps. xcvii. 5); or for fear and discouragement (Ps. xxii. 15). In the Talmud mention is made of the use of wax ("sha'awah") for lighting purposes, probably in the form of candles (Shab. 20b; comp. Rashi). At present wax candles are frequently employed on the Feast of Ḥanukkah in places where olive-oil is not easily obtainable. On the eve of the Day of Atonement and at the anniversary of the death of a relative (Jahrzeit) it is customary to light in the synagogue large wax candles that will burn at least twenty-four hours. A candle made from braided wax tapers is used also for the Habdalah ceremony.